Rachel's favorite books (and one DVD) about oysters. Impress your next book club. One of my favorite books of all time, about a young magazine writer who puts her life on hold to work at a Duxbury oyster farm, deep in the trenches and freezing-cold winters, of Island Creek's oyster beds. Erin, the writer, smartly incorporates neat oyster farming facts and even a little oyster science into her story. And great recipes too!! This story is about a Texas dude who travels around the world tasting oysters. Must be nice. But an entertaining and educational story, and an enjoyable and fun read. All I thought about was how absolutely amazing the research for this book must have been. Rowan Jacobsen, the author, travels worldwide and tastes oysters across the globe. A must-read for the oyster fan who wants to broaden her horizons. I brought the book with me to the Island Creek Oyster Bar to do some reading about the menu! This guy is a professional oyster competition shucker. Awesome. And he writes about shucking, oyster bars, and a some oyster history. Another book by Rowan, although not exclusively about oysters, you read about farms across North and South America and how they have conditions that can produce the best-of-the-best because the earth and the ecosystem provide perfect conditions for producing the food. Your mouth will be watering. My husband and I seriously considered devoting part of our lawn to finding out what our terroir could grow. This is a beautiful book about history of oysters and farming in the Northwest United States. A well-done book with pictures too. This is an independent film about oysters and the environment. Oysters clean the water and provide a nice habitat for hundreds of species. So basically oysters are a building block for marine life. 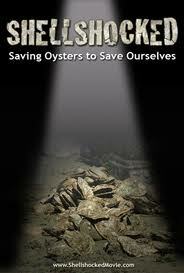 The film is about using oysters to improve the polluted waters of New York bay. Proceeds from the purchase of the film go to the restoration project. Purchase the DVD here. Read more here. Compiled by Rachel H. Ravenous reader. Perfectionist oyster-shucker. She is so cool she serves her oysters on shaved ice, using a snow cone machine. For an oyster shucking knife, click here. For an oyster shucking glove, click here.